So mostly through the ironing pile, I slapped on the second DVD – Dawn of the PLanet of the Apes. Set some 10 years after the first film, the Apes are holed up outside San Fransisco, with an allusion to a plague killing most of the humans. This could have been expanded upon. Then they (the Apes) encounter a human scout group who are out and about trying to get hydro-electric power going again. After initial distrust is overcome Ceasar allows the humans into his territory to get the power going again. As usual, all power structures are at risk to usurpers. The apes then go and find out that the humnas have a massive cache of weapons. Talking of which, the humans are holed up in a fortified settlement, lead by Gary Oldman’s character – another criminally wasted talent. Talking of talent, the guards on the weapons cahce, are criminally lacking in talent. When they spot one of the apes, they are totally suckered by the apes, apish comic routine, with predictable results. Hmmm…end of civilisation…intelligent apes on the loose…oh gosh isn’t that a cute ape routine ? DUH. 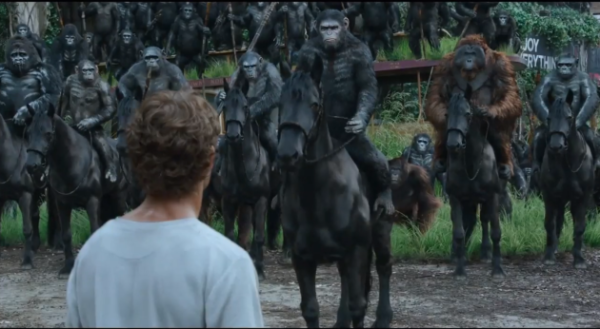 The apes then turn up on the doorstep of the humans on their magically acquired and maintained horses. The scene is then set for a set to, and after predictable shennanigans of betrayl, stupidity, and suddenly acquired marksmanship the human enclave is over run. The opposition amongst the apes is also suddenly rounded up and imprisoned, whilst Gary Oldman’s character goes ape (excuse the pun) and decides Armageddon times are here again and tries to blow everything up….Just as the radio operator manages to gain contact with a military unit of humans to the north who can save them all. 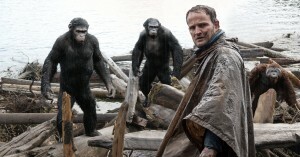 The apes have their own leadership contest, with Caesar overcoming his would be assassin. There is a touchningly farewell with Ceasar and the main human charcter recognising both sides have bungled it and they’re headed for war – regretably. This sounds like a very negative review. Actually this film, is much much better than “Rise of…” with much better plotting and potential for sequels. It is the ‘Hollywood’ plot elements that let it down. Again excellent CGI which is seemless with ‘real’ footage. Overall this film is something I will watch again and is really quite good. These two films might have been better as a TV style series – BSG comes to mind – so that a lot of the sub plots could recieve a lot more attention and some of my critique could have been explained away. A lot of good ideas for wargaming also spring to mind out of this – mostly on the survivalist angle.